“Michelle and Peter” have been clowning together for five years. They started as juggling clowns in parades and at festivals but soon discovered that children would rather juggle themselves than watch someone else do it. So after seeing the kids abscond with their juggling props on many occasions, leaving them with nothing to do, they acquired teaching equipment and started to conduct workshops in addition to performing. 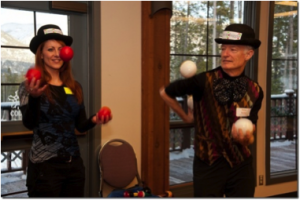 They now teach juggling to children and adults in Canmore Recreation Department programs, in school classes, and at numerous public events and festivals, and have become mentors for the middle school juggling club. They teach diablo, devil sticks, scarves, three and four ball juggling, and clubs, with exchanges. Workshop sizes can vary up to 20 to 30 people. In crowded confined spaces rudimentary magic is their default entertainment. “Mad Science” for schools and science fairs is a new routine for 2013. “Michelle and Peter” are Michelle Preston, Head Librarian of the Canmore Public Library, and Peter Nichol, cardiologist and Director of the Canmore Hospital Cardiology Laboratory.